The luxurious 5-star Rosewood Hotel located at 252 High Holborn, previously the Chancery Court Hotel, reopened last October after an extensive refurbishment. The hotel’s launch also brought along some new dining options, one of which was Scarfes Bar. The bar was named after Gerald Scarfe, a London born satirical cartoonist who worked for Punch magazine and Private Eye during the early 1960s. Scarfes Bar has not only borrowed Scarfe’s name, but also his artistic vision by showing off a selection of his distinctive drawings of historical and well-known personalities. Scarfes Bar epitomises the height of English sophistication. There are cosy armchairs and sofas, dazzling chandeliers and bookcases lined with antique books dotted throughout the room. But the focal point of Scarfes is the gorgeous fireplace that gives it an air of an old English manor. Although a bar, Scarfes Bar also serves a lunch menu. Head Chef is Indian-born Palash Mitra who moved to the UK in 2007 to join The Cinnamon Club as the Senior Sous Chef. As such the menu is predominantly Indian, although there is a small selection of traditional casseroles and pizzas on the menu as well. 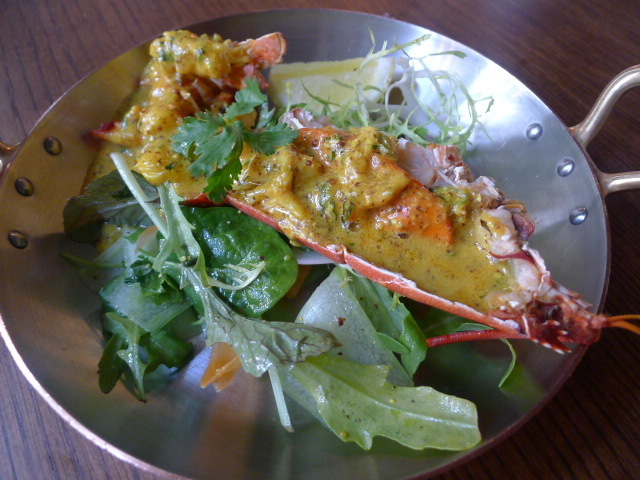 Our first starter was a half lobster with Bengali spices (£18) consisting of Indian green mustard, ginger, chilli and Indian mustard oil. The spicing was excellent and resulted in a sauce that was wonderfully creamy from the use of coconut milk. The lobster was a little lacking however as it’s texture was soft and flimsy. Clove-smoked mackerel (£8) perched on top of brioche had been well prepared with the smoking effect giving way to an interesting aftertaste. The mackerel was accompanied by a delicious crab ketchup but a second condiment of tomato chutney tasted odd. Individually the mackerel and the crab chutney were nice, but on the whole this dish did not quite come together as there wasn’t enough acidity to cut throughout the oiliness of the mackerel. 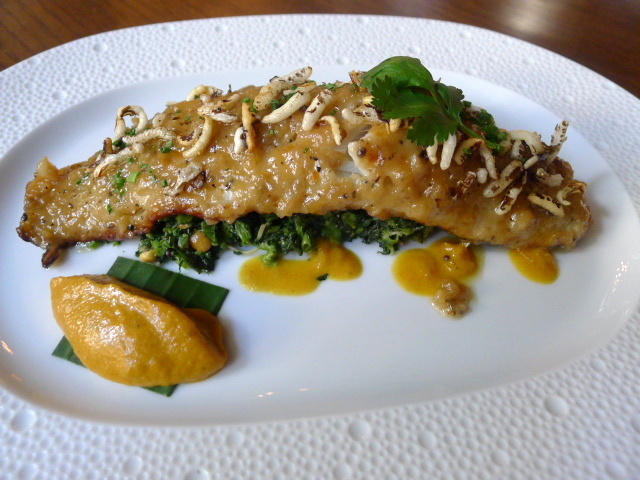 A pan-seared sea bass came with a gorgeous South Indian Kerélan curry sauce (£21). Made with caramelised onions, tomatoes, chilli, turmeric and coconut milk, it had been slow cooked to produce a rich creamy result that was both sweet and slightly tangy. The fish was nicely cooked and moist and was served on an interesting bed of sautéed spinach stems, grated coconut and roasted gram. 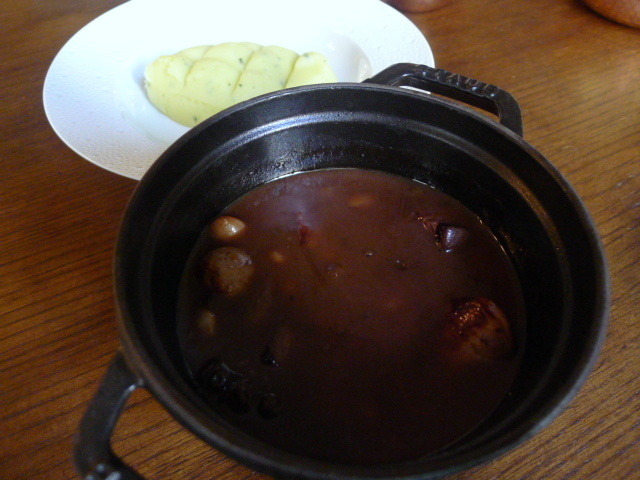 For something a little different we also tried a game sausage and lentil stew (£19) with mashed potatoes. This dish wasn’t much to look at, but the sauce was deliciously rich from the use of red wine and from the flavour of the game sausage. The use of lentils worked well in the stew. We also tried the sides of aloo mattar (£4.50), a pea and potato curry, and dal makhani (£4), a lentil curry. Both were wonderfully tasty. However, a side of stir-fried seasonal greens (£3.50) was unusually acidic. Desserts were more British in nature. 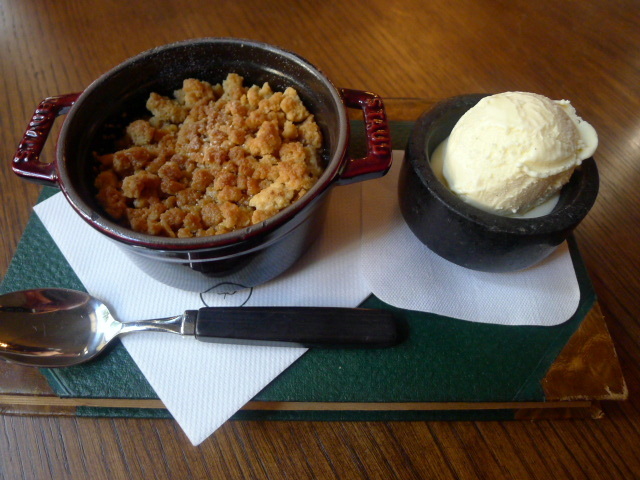 A rhubarb crumble with vanilla ice cream (£6) was really satisfying with a deliciously crunchy top and a rhubarb filling that was neither too sharp nor too sweet. 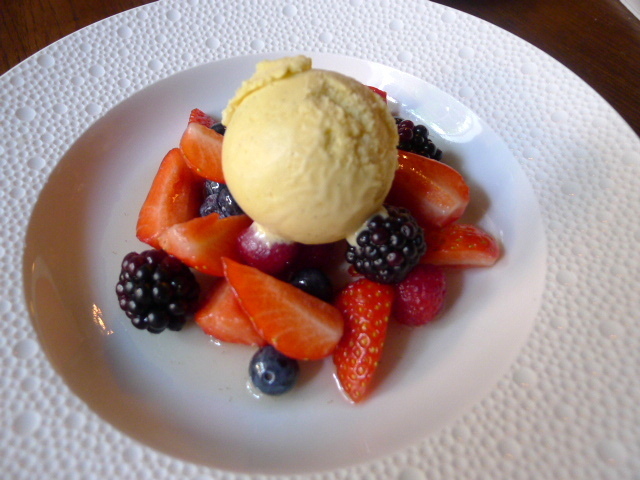 Sweet berries (£6) were served with a drizzling of yummy cinnamon syrup and a spiced almond ice cream. 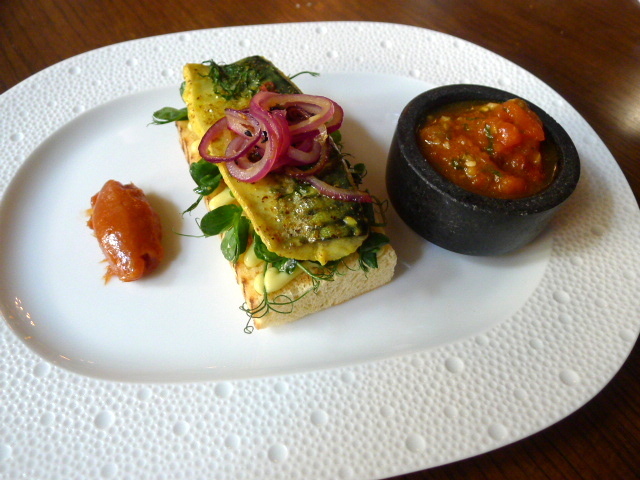 The menu at Scarfes Bar proved to be a wonderful celebration of Indian curries. Intensively flavoursome, each of the curries that we tried showcased wonderful spicing and great care in their preparation. We weren’t enthralled with the mackerel dish and the lobster could have been of better quality, but otherwise there was much to like about the food. The setting was sumptuous and grand and Scarfes Bar not only provides a great setting for lunch but also for a drink. However, being away from the thick of the West End, our Sunday afternoon lunch proved to be a rather quiet affair. We had a really pleasant time nevertheless, and our waitress was wonderfully attentive. Prices: £25 to £60 for three courses, excludes drinks and service.